Trying out the trendy keto diet? These nutritionist-developed recipes will help get you started. Low-carb diets aren't exactly new but a higher-fat version of the low-carb lifestyle is getting a lot of buzz, with celebrity fans and even doctors singing its praises. It’s called the ketogenic diet — keto for short — and while it’s getting a lot of attention now, it’s actually been around since the 1920s and was originally developed as a treatment for epileptic seizures. The keto diet has resurfaced as an effective weight-loss method and has gained traction in the medical community as a possible treatment for some types of cancer. The diet is high in fat (60-80 percent of dieters' daily caloric intake), moderate in protein (15-35 percent of calories) and very limited in carbohydrates (5 percent or less). To put that in perspective, if you're eating 2,000 calories a day, that's just 25 grams of carbs, which is equivalent to what you'd find in a medium-sized granola bar. While the keto diet may sound like a license to dig into a jar of bacon-studded peanut butter (and skip your veggies), it can actually be quite tricky to follow. It’s a challenge to create meals that are so low in carbohydrates and, since most packaged foods are higher in protein and carbs than fat, you’ll need to spend some time cooking most of your own meals and snacks. Using medium-chain triglyceride (MCT) oil from coconuts is often used in keto recipes because it adds a lot of healthier fats, with zero carbohydrates or protein. Other coconut products, like regular coconut oil, coconut butter and shredded coconut are popular keto ingredients. I’ve created a day’s worth of recipes, using real ingredients, to show you what a day on the keto diet really looks like. As a registered dietician, I don’t recommend this diet for just anyone looking to lose weight (or as a long-term maintenance plan), because it can lack variety. Plus, many of the foods that we know help boost longevity, like pulses, whole grains and root vegetables are banned on the plan. But it doesn’t cut out all of the beneficial stuff. You can enjoy vegetables like cauliflower, cabbage, avocado, broccoli, kale, asparagus and Brussels sprouts. Fruit selections are limited, due to their carb and sugar content, but you can eat small amounts of berries. Wine lovers can even enjoy the occasional glass, since a 5-ounce glass of red or white wine only contains 2 grams of carbs. While the ketogenic diet is safe for many people to try, it can be taxing on your kidneys and isn’t right for everyone. As with any restrictive diet plan, you should consult your doctor before trying it if you have pre-existing health issues, including diabetes, heart disease and high blood pressure. And the ketogenic diet is not appropriate for children or pregnant or nursing women. Breakfast on the keto diet is pretty easy to do as long as you steer clear of bread, cereal, pastries and juice. Bacon is a preferred ingredient because it has plenty of fat, but only modest levels of protein. 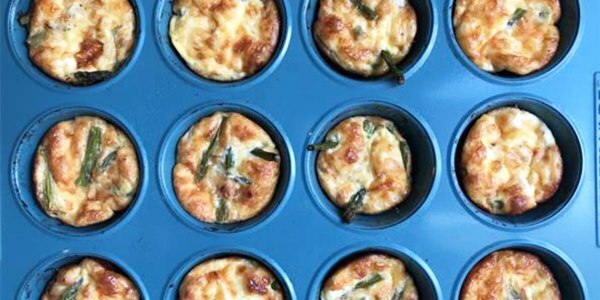 Eggs are a no brainer and can be used in a myriad ways, like in these cheesy, veggie-filled frittatas. Make them in advance and enjoy them all week long for on-the-go breakfasts. They're just 113 calories each, so depending on how many calories you're eating each day, you can enjoy two to three in the morning. 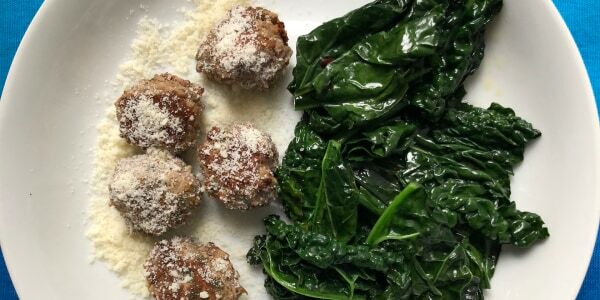 Meatballs are a great make-ahead lunch or dinner on the keto diet. But you won’t be using breadcrumbs to bind your meat mixture together. Instead, pick up some almond flour, which is low in carbs and works well in plenty of baked goods. Instead of kale, you can also add a salad with your favorite greens to this dish to round it out. Vinaigrette is a keto-approved dressing, just make sure the one you pick doesn’t have added sugar. You can always whip up a quick one yourself. You may think that depriving your body of carbs will prevent you from being able to exercise, but the keto diet is actually incredibly popular with endurance athletes. I reformulated a power bite recipe that I’ve been using for years by pumping up the fat and reducing the carbs. 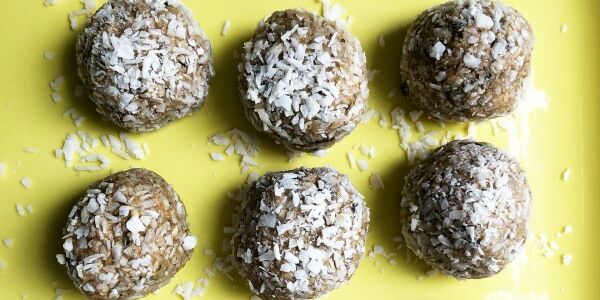 Still, these balls are a little bit higher in carbs than strict keto adherents allow for, but if you stick to the keto guidelines during the rest of the day, these nutty-chocolate bites can definitely fit in for a quick energy boost, pre- or post-workout. Salmon is naturally rich in heart-healthy omega-3 fatty acids. Brussels sprouts contain choline, which is an important nutrient for brain health, and walnuts boast antioxidants that may help prevent Alzheimer’s disease and may also help boost your mood. 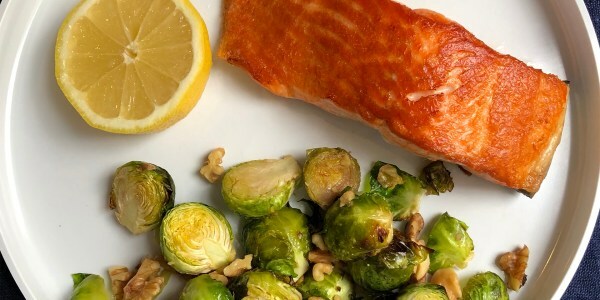 Put these three ingredients together and you have a health-boosting meal that anyone can enjoy, whether or not they're following a keto diet plan. Frances Largeman-Roth, RDN, is a nutrition expert, writer, mom of three kids and a best-selling author. Her books include "Feed the Belly," "The CarbLovers Diet" and "Eating in Color." Follow her at @FrancesLRothRD and check out her website.